Trey Adams won't play in their season opener against No. 9 Auburn — but it's not the knee surgery he's been rehabbing from that prevented him from making the trip. Washington senior left tackle Trey Adams, a preseason All-American, will not play in the No. 6 Huskies’ season opener against No. 9 Auburn because of a back injury, multiple sources told The Seattle Times. Adams did not make the trip to Atlanta with the rest of the team. 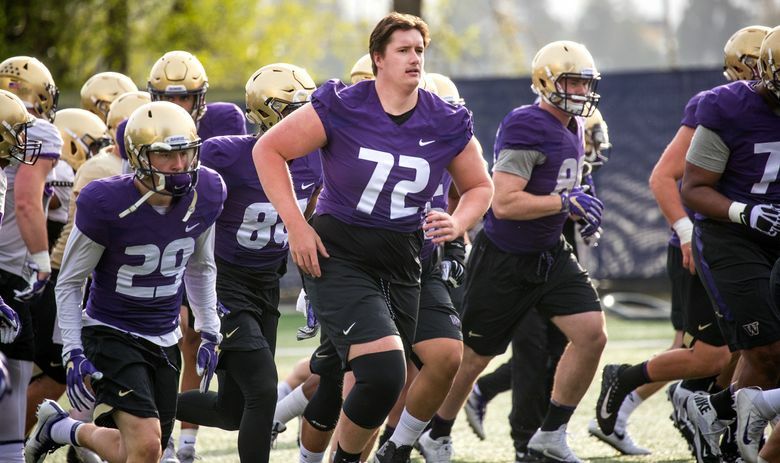 The Huskies this week listed junior Jared Hilbers as Adams’ backup at left tackle. Sophomore Luke Wattenberg, the first-team left guard, is a more likely option to start at left tackle against Auburn (12:30 p.m. today, ABC). Wattenberg started the final five games of the 2017 season after Adams was lost to a season-ending torn ACL last October. Junior Henry Roberts also spent some time at left tackle during fall camp. Last month, Adams said his rehab from knee surgery had been going well and he was on track to return for the season opener until the back injury flared up in recent practices, a source said.